The season (almost) everyone looks forward to. I must admit, I sometimes eat Spanish or Chilean asparagus whilst I wait for the English asparagus to arrive in May, but when they are available we eat nothing but the home grown variety. Last week, I received a kg of asparagus last week, freshly cut that morning. You could tell they were spanking fresh: they smelled of nothing but asparagus, the buds were tight and the spears snapped easily and juicily in two. Asparagus contains asparagines, a phytochemical that acts as a diuretic., which may explain why the ancient Greeks used asparagus to treat kidney problems. And also why your urine has a strong smell directly after eating asparagus. Anyway, here follows a description of what I did. Whilst you are getting on with the prep, pre-heat the oven to 180C. 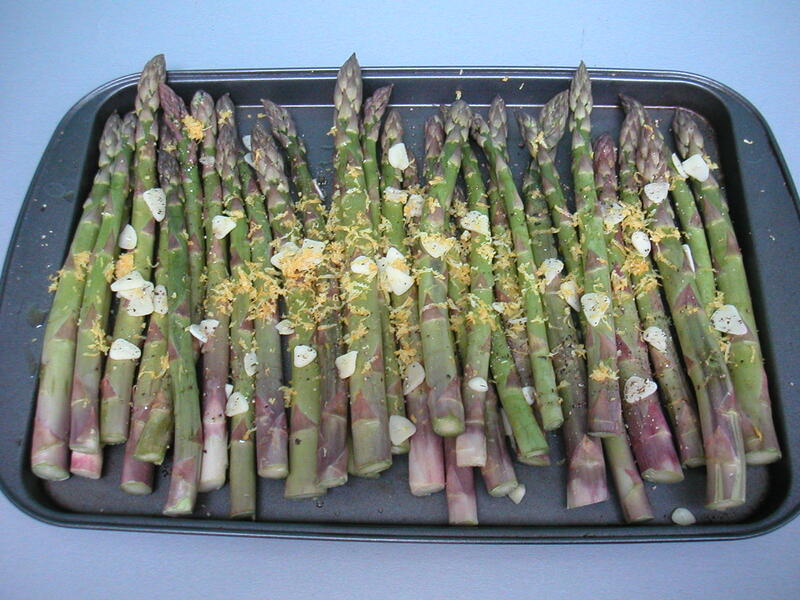 Spread the washed + dried asparagus out on a baking tray, making sure they form a single layer. You want the spears to brown lightly and if they are piled on top of eachother they’ll end up cooking but not browning. Drizzle over the olive oil, sprinkle with lemon zest, pepper + salt and divide the sliced garlic cloves. Bake for 25 minutes or until just cooked and with nice brown edges. Eat as they are, lukewarm, or with some shaved Parmesan, Pecorino or goats cheese. 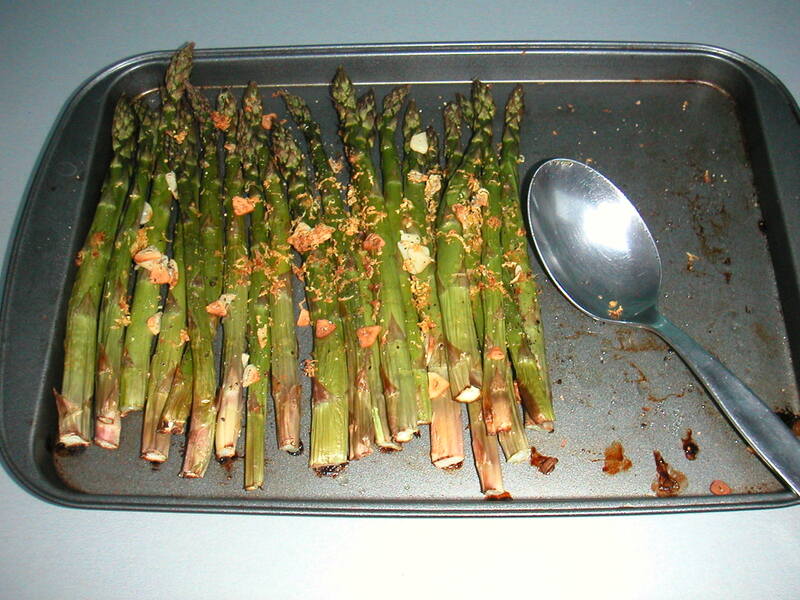 We ate the remaining asparagus the next day. Chop the asparagus roughly and mix through just cooked linguine (I allow 100g dried pasta per person) with the juice of a lemon, 2 tbsp of low-fat creme fraiche, a generous sprinkle of chopped chives and freshly grated Parmesan. Add some of the reserved cooking water from the pasta if the mixture is too dry + serve straight away on warmed plates.